Tech’s Athletic Program has inspired and motivated thousands of student-athletes for more than a century. Below are brief descriptions of the Bulldog teams for each season — fall, winter and spring. You’ll note that some sports have webpages hosted on MaxPreps — the Oakland Athletic League’s chosen platform — that are maintained by coaches and/or parents. If you’re interested in volunteering to manage a sport’s content, please fill out this Google Form as well as notify the team coach(s). A few teams use other communication vehicles such as Facebook and standalone websites. Tech’s Cross Country team is a dedicated group of student-athletes who work to support and encourage one another to achieve their individual and team best. Football has been a part of Tech since the school’s founding in 1914. The team is family-centered, education-focused and powered by a strong desire to ensure that all student-athletes are equipped with the life skills to carry them throughout adulthood. Tryouts: Begins in Jan. with off-season weight training; Passing League in June and July; and official practice second week of Aug.
Women’s Golf at Tech started in 2013 as a coach-initiated endeavor. Once learned, golf can be enjoyed for the rest of one’s life. Golf clubs are provided during the season. Practices: After school Mon-Thurs at the Lake Chabot Golf Course above the Oakland Zoo. Bulldogs on ice? You bet! The coed Ice Hockey Team was formed in 2009 by Tech PE teacher Kelly Haskins and has been nurtured by volunteer support from Oakland firefighters and a host of parent volunteers. The team competes against club teams in the non-checking high school league run by the San Jose Sharks. Our program is about fostering a love of the game of hockey while building friendships and character through team play. We try to find a spot for everyone who comes to tryouts. Equipment is provided. Practices: Twice a week at the Oakland Ice Center in Uptown from Sept. into mid-March, with games starting in Oct.
Tech’s tennis teams have a long history at Tech and have been the launchpads for a number of highly competitive players. Practices: Team practices are Monday, Tuesday and Thursday on Tech’s four tennis courts. Open courts are available for individuals to play and/or practice Wednesdays and Fridays. Tryouts: Normally held prior to League matches in early Sept.
Tech has been home to a rowing team off and on for 50 years, and is currently sponsored by the East Bay Rowing Club and USRowing “America Rows” program. Practices: 4 days a week after school plus Saturday mornings at the Jack London Aquatic Center in downtown Oakland. Students either take the bus, drive, or bike to practices. Regattas: Are held throughout Northern California on the weekends, plus a Southern California trip in the spring for the West Coast Scholastic Championship. Tryouts: All interested students are welcome to join the team. Tech’s men’s highly competitive basketball team has been a big, exciting part of the school community for generations. Practices: 5 days a week and an occasional Saturday in the Boy’s Gym and Girl’s Gym. Conditioning takes place Sept. and Oct.
Tryouts: Open Gym and tryouts are held at the end of Oct./early Nov.
Women’s basketball has been around since the inception of the High School in the early 1900s. Both experienced and inexperienced players are encouraged to participate. Tryouts: Held during the first week of official practice in early Nov.
Bulldogs on ice? You bet! The coed Ice Hockey Team was formed in 2009 by Tech PE teacher Kelly Haskins and has been nurtured by volunteer support from Oakland firefighters and a host of parent volunteers. The team competes against club teams in the non-checking high school league run by the San Jose Sharks. Our program is about fostering a love of the game of hockey while building friendships and character through team play. Equipment is provided. Tryouts: Usually in the first week of Sept. — no experience necessary. We try to find a spot for everyone who comes to tryouts. Established within the past decade, Tech’s Men’s soccer team is the proud winner of several championships and is now one of the school’s most popular sports. Women’s Soccer has been thriving at Oakland Tech since its inception in 2009 and boasts a number of championship titles. Men’s Baseball has been a treasured sport at Tech for more than a century. Women’s Lacrosse began at Tech in 2011 inspired by student and parent interest. 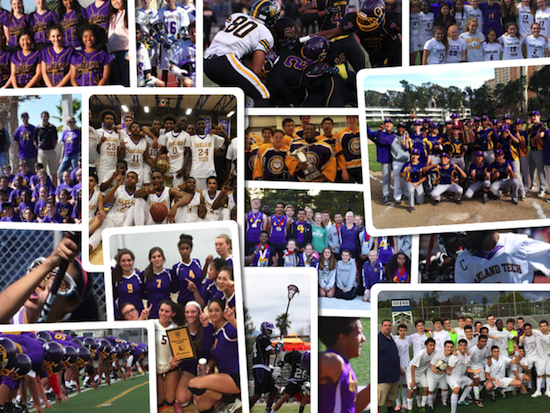 Games: Most games are played at Tech against public and private school teams in the Oakland, Berkeley and San Francisco area. Tryouts: Take place the first week of Feb. Swimming has enjoyed great success at Tech. The team has dominated league swimming over the past several years, winning its meets consistently and capturing league championships in all events. Meets: Typically held on Fridays. Practices: Held on the 4 tennis courts on campus, team practices are Monday, Tuesday and Thursday. Open courts are available for individuals to play and/or practice Wednesdays and Fridays. Matches: OAL matches against league school are held on campus at Tech or Skyline. Tryouts: Normally held prior to League matches in late Feb.
Men’s Volleyball started in 2015 initiated by the OAL League to add more athletics to the district. Tryouts: Late Jan. for 2-3 days.